Four days have gone by since we last looked at Dissidia Final Fantasy's character roster, and four more familiar faces have strutted their skills in their own personal launch trailers. Well… three familiar characters at least, the first of which is Final Fantasy IX's Zidane. Fans tend to forget about Zidane, but that's probably because he's a non-descript character. Not to say that he's not fun, but the point of Final Fantasy IX was to recreate the feeling of the older Final Fantasy games, not tell a deep, convoluted story with a sulking main protagonist at the center of it all. Being introduced in the shadow of Cloud, Squall, and their appeal to teenage boys was a hard step for the monkey-tailed thief to overcome. Still, Zidane rightfully has his fans and they'll be happy to use his agile fighting skills in the upcoming arcade fighting game. 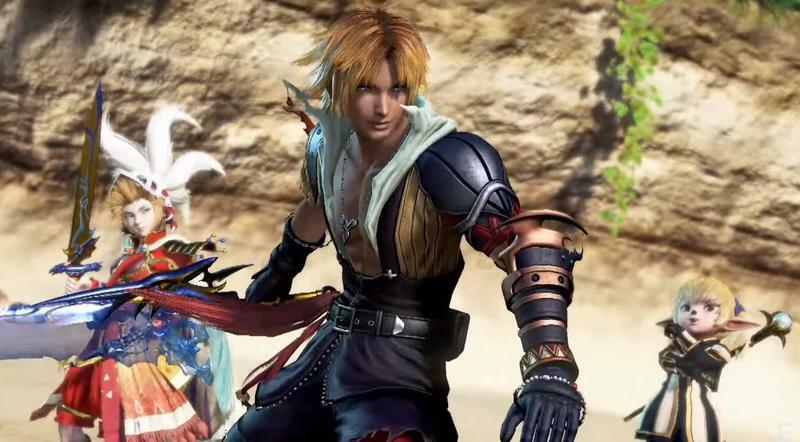 Then we have Final Fantasy X's Tidus, who I am going to come out and say is my favorite protagonist in the whole series. He's not a popular choice because people claim he is a whiny brat who looks like Meg Ryan, but I've actually gone back to play Final Fantasy X recently. He's no such thing… about the whiny part at least. I can't think of any particular moment when he actually gets upset without good reason, and he is a hell of a lot more fun than the brooding Squall. His fighting style revolves around a lot of flips and diving attacks, similar to his Blitzball moves in Final Fantasy X. And then there is Shantotto… *shrugs* I never got to her during my short time with Final Fantasy XI. I guess you need at least one character from every entry in the series, and Square Enix just decided to go with her. It's a good choice too, because the game already has enough brutes and sword-swingers, and a pipsqueak pure-mage will provide a completely different style of play that the other characters don't offer. Variety is key to success in fighting games. And lastly, we have Final Fantasy XII's Vaan. Not a lot of people like Vaan, but he's not so bad if you know how to appreciate him. And no, it requires no chemical enhancements, just a bit of research. The word is that Director Yasumi Matsuno was forced to shoehorn a relatable character into the complex political story he really wanted to tell, something for the younger Final Fantasy fans. Vaan and his lady friend Panelo are the results of that publisher interference. All of the other Star Wars-esque characters that Matsuno really wanted remain intact: a princess, a wise old soldier, a rogue pirate, a furry. Panelo and Vaan provide just a commoners' perspective into it all… like C-3PO and R2-D2. In Dissidia, Vaan has the same sword-swinging style as the others, but he appears to rely a bit more on magic. Dissida Final Fantasy launches in Japanese arcades this week on Nov. 26. We have three more characters to go, but I'm still holding out for Final Fantasy Tactics' Ramza to have a surprise trailer on launch day. He's the real best protagonist in the series, but he's not usually in the mix since he's from a spin-off.